Dark chocolate and peppermint is a great combination. Peppermint flavored candies, for instance, tend to have a really sharp sweetness to them that is tempered perfectly by the strong, but not too sweet, flavor of dark chocolate. A York peppermint patty, for instance, is a great illustration of how well this combination works and – for mint fans – it works in many different forms, such as coffee drinks. This mocha is made with dark chocolate and cocoa powder, and is spiked with a bit of peppermint. I used a small amount of peppermint extract. Peppermint extract can be very strong, so add just a few drops at a time if you’re worried that the overall flavor will be too strong. The finished drink has a kick of caffeine and a kick of peppermint, and ends up being both refreshing and indulgent. 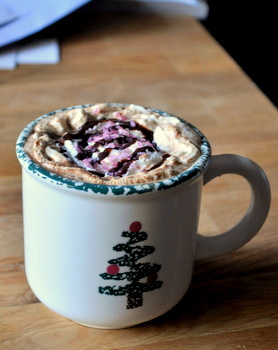 Feel free to replace the coffee with milk if you want to make this for the kids on a holiday morning! Chop up dark chocolate into small chunks. In a small saucepan, combine chocolate and cocoa powder with milk, and cook over medium-heat, stirring frequently, until the mixture is smooth and hot (do not let it come to a boil). Add peppermint extract and sugar, if necessary, to taste. Divide mixture into two large coffee mugs and top off with hot coffee. If desired, top with whipped cream and crushed peppermints.